The Vatican has released special postage stamps dedicated to the visits of the Pope Francis in 2016. 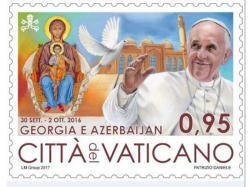 The postage stamp, dedicated to the visit of the Pope to Azerbaijan and Georgia, features photo of the Bibiheybat mosque. The visit of Pope Francis to Azerbaijan took place on October 2, 2016. Other postage stamps commemorate the visits of the Pope to Mexico, Poland, Greece, Sweden and Armenia. 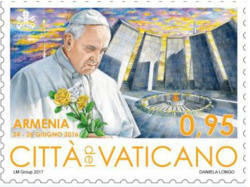 The postage stamp issued in connection with the visit of the Pope to Armenia features photo of a monument dedicated to the so-called "the Armenian Genocide".